As you’ve come to realize through my blog, whenever I travel I do a lot of heavy research before hand. The last thing I want is to feel disappointed leaving a destination having not experienced it (food-wise) to its fullest. Prior to my trip to Los Angeles, I quickly brought together a list of all the restaurants I wanted to visit. The list came together in a matter of minutes, and didn’t require a repetitive Google search of “Los Angeles+ Best+ Restaurants” to find my short list. In fact, all the restaurants I pooled together were a result of references from popular television. 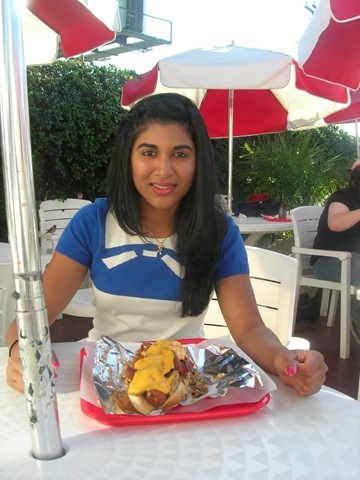 One of those restaurants is the infamous Pink’s. 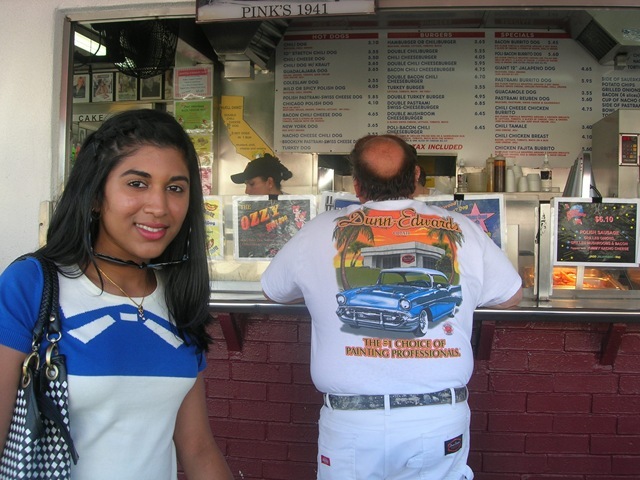 Located at the intersection of Melrose and La Brea, this hot dog stand has been up since 1939 and is best well known for serving its Hollywood celebrity clientele. It has been featured on “Nip/Tuck”, was the inspiration for James Taylor’s song “Chili Dog”, and was featured on “Jackass” where the love of my life, Brad Pitt, was abducted while waiting in line. Pulling up to the restaurant was magical. A huge sign depicting the most popular dog in town, and a massive line of hungry patrons greeted me. I honestly felt like I was in a dream, and as a result was snapping pictures like a mad woman trying to capture the essence of the energy surrounding this place. 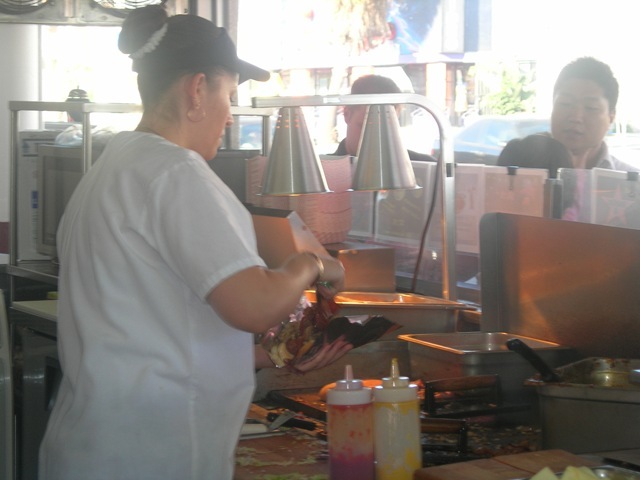 As I waited in line, I noticed the efficiency of the women behind the counter preparing the hot dogs, burgers, and burritos amongst other things. They were speedy, wore no emotion, and definitely looked like they were on a mission. After a few moments of contemplation, I had decided what I was going to order. The standard mustard and relish wasn’t going to cut it here. In this case I had to go big, or go back to my hotel room. 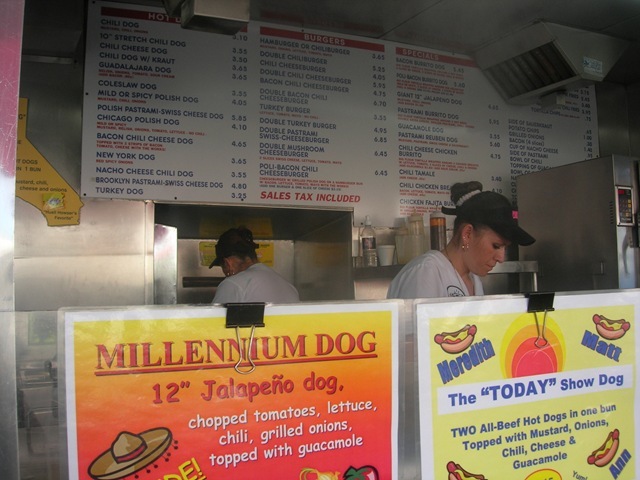 I selected the Mulholland Drive Dog, which as many things on the menu was inspired by a movie of the same name. 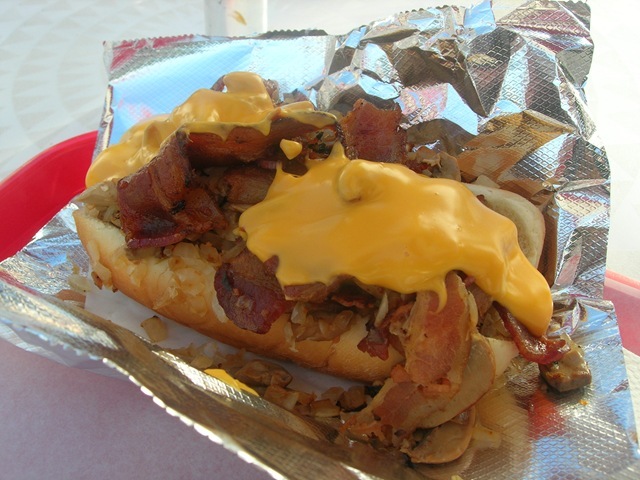 It promised of a hot dog with grilled onions, grilled mushrooms, nacho cheese, and bacon all for only $5.75 USD. How could I go wrong? I swapped the regular dog for a turkey dog and waited to the side while my order was being brought to life. 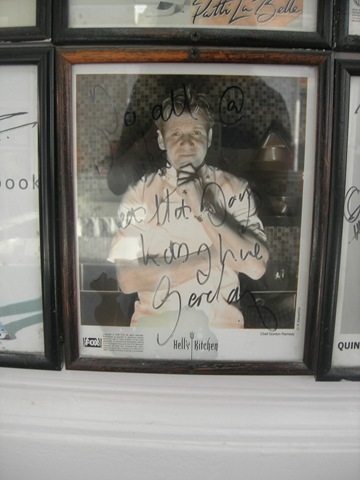 I took the time to stare at the walls around me that housed framed pictures of famous celebrities that had eaten there. In addition to the typical Hollywood A-lister (and some D-listers) I found my idols Gordon, and Martha. How lovely to know that they vouched for this place. He could have very well once touched the counter top I was leaning against. Sigh. The short wait did not disappoint. I was soon united with my dog and sat down to take a bite. 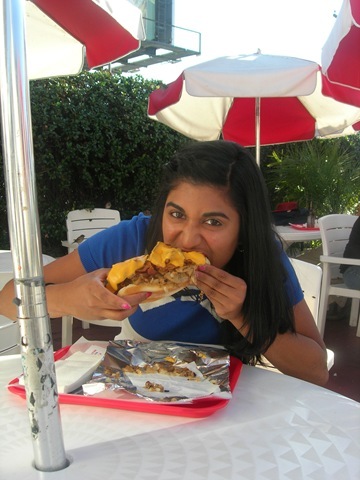 With cheese spilling off the edges, and crispy bacon glistening in the Californian sun, I felt like I was home. One bite confirmed that this artery clogging masterpiece was mine to savour alone. It wasn’t sophisticated by any means, and tasted just like it sounded. But the idea that I was dining in a culinary institution just brought my taste buds soaring to another level. If you ever plan a trip to Los Angeles, this is definitely one gem that you don’t want to miss. 709 N. La Brea Blvd. Let’s do Summerlicious? I promise I won’t flop this time…!!! I had to get the before and after shot 🙂 You should see my picture at the Flintstone’s Drive-In sinking my teeth into a mammoth Turkey leg.